It’s been much too hot to do a lot of cooking these past weeks, dear neighbors… But here is a dish that will not warm up your kitchen too much, I promise: the protein (quinoa and chicken breast) is cooked together in one single pot, and the vegetables quickly sauteed. This dish keeps VERY WELL in the freezer; once defrosted, you don’t need more than a few minutes to warm it up in a skillet, even less so in the microwave. Very handy. *gomasio is a mix of ground salt and sesame seeds; I make my own in my trusted electric coffee grinde. For more flavor, I add dried seaweed flakes. 1. Cut meat into strips and set aside. Start preparing vegetables: pepper should be seeded and cut into long strips, and half cabbage chopped rather thinly. 2. Wash and rinse quinoa thoroughly several times – do not throw away the water: depending on where you live, your indoor or outdoor plants might need it! 3. 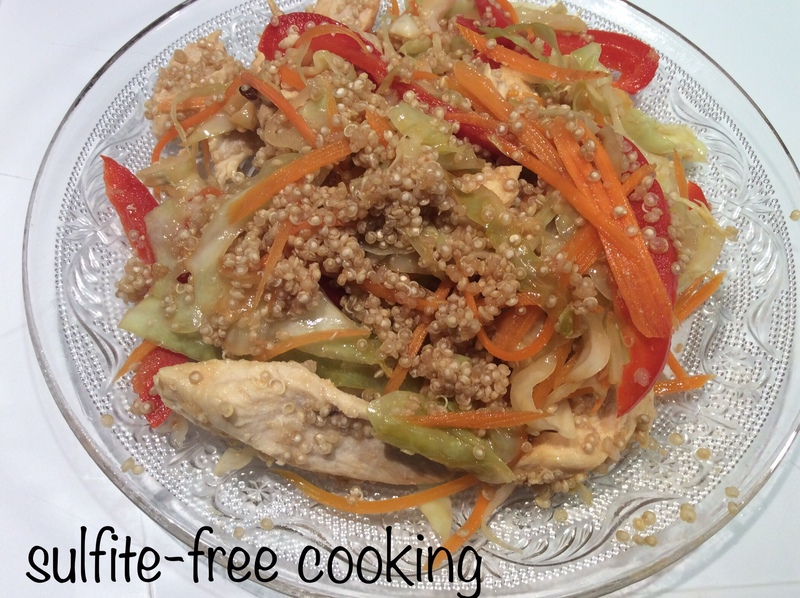 Cook quinoa and chicken together in salted water, on low. This should take about 15 minutes after boiling point; when the germs pop out of the quinoa seeds you can turn off the heat and strain. 4. Meanwhile, sautee cabbage and pepper in heated olive oil, between 5 to 10 minutes. Cut carrots into thin julienne strips (I use a special julienne knife) , add to other vegetables, stir and cook a little longer, just enough for the carrot to “relax”. 5. Stir in strained quinoa and meat. Serve hot or warm, seasoning with tamari and sesame oil (and gomasio) in each individual plate. This may seem like not much meat per person, but quinoa being already laden with protein, why overdo it? And then with the recent heatwave I haven’t felt particularly hungry. Feel free to change the amounts, dear neighbors! All recipes on this blog are only here to inspire you, and can be adapted, tweaked… If it weren’t for my husband’s problem with sulfites, I would personally add some onion at step 4 – preferably Roscoff onions for those lucky neighbors who can grow or buy them! Mother Nature around us is becoming more and more thirsty… Not a drop of rain in several weeks. Not wanting to wait until the impending restrictions that are bound to be imposed on us, I save water that would normally go down the drain, such as what I use to wash and rinse vegetables – or quinoa as in this recipe, for my flower bed. I also selflessly give some of my own blood to the little bugs that hide in the rows of beans or my revived rose bushes! My legs and arms can attest to the blunt fact that I am apparently not as high in the food chain as I thought I was 😄 ! Previous beet and cucumber salad in a cool mint yogurt dressing… and not so peaceful summer nights! Thank you Kathryn, why, we have both been under attack it seems! Here it has been very dry, so I thought the bugs were looking for any type of easy open bar event 😄, but then of course, as you pointed out, there is also the kind that proliferates in steamy weather. Basically, we are doomed 😩. Our vegetable patch and our lawn are looking very sad now. We had thunderstorms and rain at last during the night, but it will take a lot more heavenly water before they recover. At least we are breathing better today. Take care, “à bientôt” 😊! I’m a very bad neighbour for commenting, aren’t I? I do read the recipes, and always appreciative the mentions of freezing suitability, but forget to comment or haven’t much to say. This looks really great and I’m glad I’m not the only one who appreciates quinoa, I remember when I first tried it. I made twice as much as I could ever eat, had it plain with curry. It wasn’t the best start but I did persevere. I hope you aren’t staying out too long in the sun, it can be easy to lose track of time. Take care! About which, to get to appreciate it one needs to wash it very well. For less informed neighbors, I should have mentioned I rub the seeds between my fingers in a pool of water to rid them of their natural bitterness. I have never had quinoa curry. Sounds tasty. My husband tells me that I am tanned —- quite surprising, as my time outside has been limited: mostly before 9 am to pick beans, take a look at the raspberry bush or hang laundry, then again in the evening after 8:30 pm to water and talk to my rose bushes. They really came back to life in spite of the heat, and I congratulate them as I go about snipping withered flowers. In the meantime, my husband gives water to a camellia plant that we bought this spring: we were told to take especially good care of it during its first summer in our yard. We usually stay outside for a while at that point, until it begins to get dark and the local mosquitoes start feasting on us… They must have somehow found out that we both have universal blood donor type, O negative!!! You and me both on the quinoa, once established it just shot up and when the seed-bearing heads appeared I was shocked at the size, with new off shoots coming too. Apparently the home-grown needs a lot of de-hulling and washing, you can be sure there’ll be a post about it if it reaches maturity. Well, I’ve never heard of gourmet insects until today!